ASUS GPU Tweak is the best software for overclocking any graphic card and enable PC users to get the best out of their graphic cards. It is associated with a lot of fun and intrigue. The software is compatible with most adaptors including the most popular types NVIDIA as well as AMD. Users do not necessarily need to have an installed ASUS board in order to tweak their graphic cards. All you need is the ASUS GPU Tweak software to transform your PC’s graphic card. It comes with an amazing user interface which is sleek in both functionality and appearance. It allows users of the software to successfully keep their graphic card speed clocks under control along with the installed memory and the GPU. Thanks to the sleekness of the software, users can also monitor the various details pertaining to the graphic card including the fan speed, temperature and voltage of the adaptor. You can monitor many details related to the adaptors of your graphic depending on what you actually want to observe. The information about the various components of the adaptor is displayed in a clear manner thus enabling users to successfully know what they are looking for and get it instantly. Gain access to a wide range of functionalities in a single click, thanks to the intuitive user interface that the software features. Most notably, it comes with the silent mode which allows users to enjoy music as well as videos by simply clicking on it. Enjoying gaming for a longer period of time without seeing any performance frailties in the graphics card. If you want to enjoy switching between the best and most demanding computer games seamlessly and conveniently, this is the software to try. You can successfully do by means of the software’s OC mode which is primarily available for unlocking maximum game performance. It does more than just enable you to switch between multiple demanding games. You can also record and stream games in a single click. This is facilitated by the software feature XSplit Gamecaster which allows for on-the-fly recording and streaming of games. 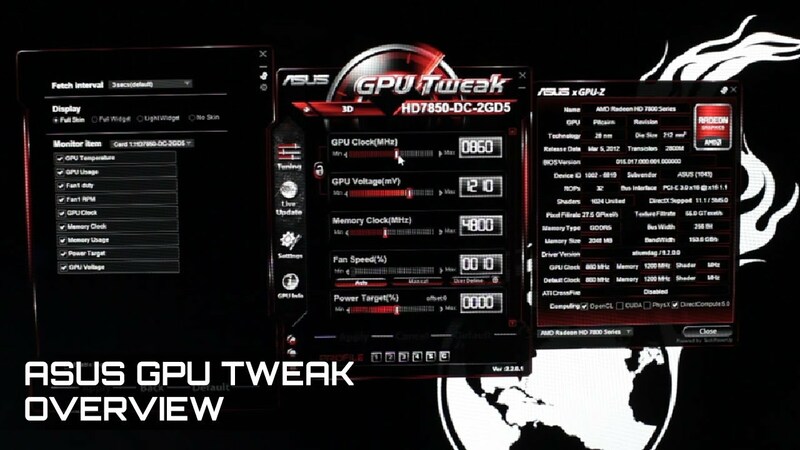 What do you think about ASUS GPU Tweak?